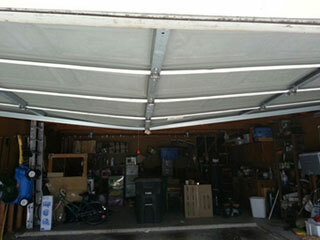 Garage doors are more complex than they seem at first, requiring an array of springs, rods, and interlocking parts. During maintenance, we will thoroughly examine all your door's parts, big and small, to make sure that there are no problems lurking behind the scenes. As with any piece of machinery, maintenance can go a long way in preventing costly or time-consuming future repairs. With the proper maintenance, you may not need to worry about having your door fixed for years. Our service technician will walk you through the routine care that we'll perform to allow your garage door to function smoothly throughout its entire lifespan. Our qualified personnel has the experience necessary to perform visual inspections on your door and diagnose the warning signs of a part that is about to break or has broken from wear, tear, or rust. Have your door inspected at least once a year. Maintaining your garage door can mean added safety for you and your family by way of home security, property damage, and personal injury. A broken door may look like an opportunity for a break-in, and a malfunctioning door may damage your car or other property stored in your garage. A door that breaks suddenly and injures an individual is more than a nuisance - it can mean a hospital visit. Scheduling routine maintenance with Garage Door Repair Plymouth includes a safety test to prevent accidents from happening to you, your car, or any other property or persons in the vicinity. Call today to book a maintenance appointment to prevent problems in the future. Let us help keep you going strong!